Cadmium, Lead & Nickel Free!! Exclusively Ours! An Allan Robin Design! Silver Tone Lobster Clasp Bracelet Suspends Six Christmas Themed Charms, Including "Jesus Is The Greatest Gift Of All" & "Glory To God In The Highest" Round Charms, And A Detailed Crucifix Charm! Bracelet Measures 7" Long, Plus 1" Extender. 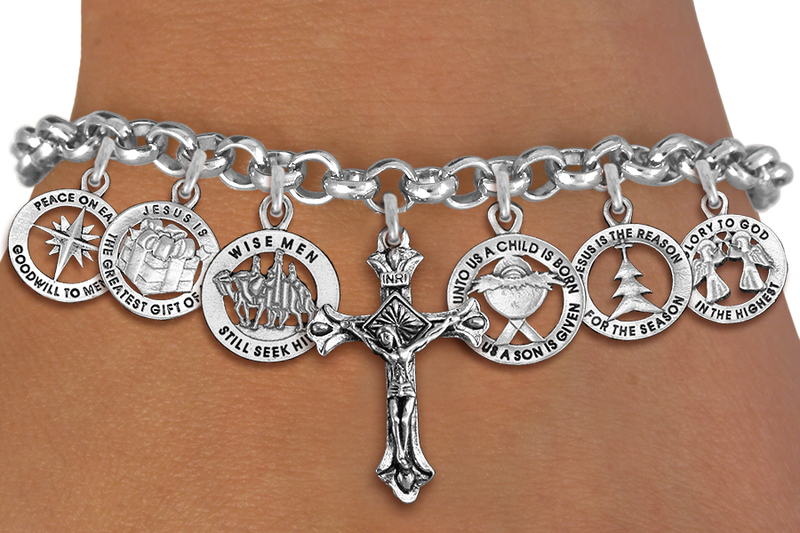 Crucifix Charm Measures: 1 1/4"h x 3/4"w.
Christmas Charms Measure: 1"h x 3/4"w.
-Peace On Earth, Goodwill To Men. -Jesus Is The Greatest Gift Of All. -Wise Men Still Seek Him. -Unto Us A Child Is Born, Unto Us A Son Is Given. -Jesus Is The Reason For The Season. -Glory To God In The Highest.